Organizations, especially not-for-profits, face many daunting challenges today. With valiant missions and goals to impact a social issue or cause, they aspire to make a difference in the world. Yet competition to win funding, donors, and sometimes even clients/program users, pulls attention away from the true organizational focus and onto more mundane activities such as fundraising and budget scrutiny. These are the hard realities of life in the NFP world. 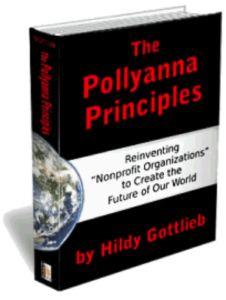 According to Hildy Gottlieb, author of The Pollyanna Principles, President of the Community-Driven Institute, and “the most innovative and practical thinker in our sector, ”[i] not-for-profits, which in reality are Community Benefit Organizations, strive to end problems they see today. Their real challenge, and hope for the future, lies in seeking to achieve what they want to see tomorrow. She believes that taking a different path to create that future is required. Living and working in this ‘Culture of Can’t’ often leads to organizational strategies that tend to perpetuate the very situation NFPs are trying to change. Hildy claims that to create the path to the future we want, we need to change our thoughts and from those new thoughts, change our habits. Our thoughts lead to our actions. If we assume that the problems will always be there, then that is the expectation upon which we will act. 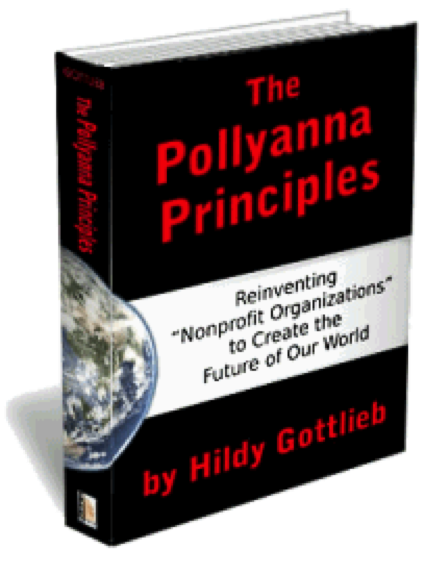 Hildy’s belief in the need for a renewed focus led to the development of thought-processes and methodologies that became the Pollyanna Principles and a way to reinvent nonprofit organizations to create the future of our world. #1. We accomplish what we hold ourselves accountable for, and therefore our potential is limited only by us. Holding ourselves accountable means we would only take actions that would better not only the lives of those involved with our organization, but would also affect the community overall. But you already do that! Question: are your meetings spent discussing practical items such as budget concerns and how to thank donors? How much time do you spend discussing how you will measure the impact of your programs in the community? #2. Each and every one of us is creating the future every day, whether we do so consciously or not. We need to change our expectations from problem-solving to vision-based results. When we work towards a powerful vision, problems are solved along the way. Divide provider organizations and their communities. Funders play a role in this as well by instating competitive funding techniques. #4. “Being the change we want to see” means walking the talk of our values. We need to root our decisions in the values we want to model in our communities. #5. Strength builds upon our strengths, not our weaknesses. Look at our assets, not our deficits. #6. Individuals will go where systems lead them, and there are warning signals if those systems are failing (frustration, blame, if only we had more money, etc). When high expectations guide the work of the leaders, and all of these principles are put into action, inspired change takes place. Hildy claims that the governing body, the Board of Directors, of an organization bears significant responsibility in the development of the shared vision and sustainable programming for the community. The book provides examples of organizations that have developed their vision, mission and values on the Polyanna Principles, guidelines for putting the principles into practice, and pointers for public officials. It is a book that focuses on creating the future we want for our communities, and this requires looking well beyond the problems. This entry was posted in Associations, Book Review. Bookmark the permalink.